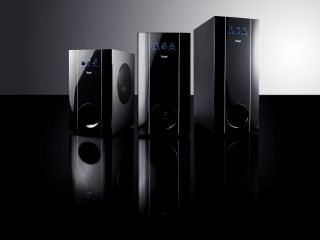 Teufel has announced a range of six new multimedia speaker sets and a new Decoderstation. The German direct sellers are hoping to convince UK shoppers that they should upgrade their home cinema or add some quality to their PC/Mac set ups with the 'Concept' range of speakers and a follow – up to their popular Decoderstation. The Teufel Concept C 2.1 sets offer up to 150 watt audio output and a choice between either a small or large speaker with a small subwoofer. The Concept C 200 range consists of CE10 Satellite Speakers and an 8in 80 Watt Subwoofer and costs £133, with the C200 offering CE 20 Satellite Speakers and a 150 Watt 8in Subwoofer for £178. There are four different concept E ranges, ranging from the £160 175 Watt Concept E 100 through to the 375 Watt E 400 at £294. Last but not least is the Decoderstation 5, which is designed to compliment the Concept range.